The Magnano Center is the new name applied to the Hickey Dining Hall / Café La Verna complex, named in honor of Louis and Patricia Magnano of Olean. The name was applied upon the construction of a new entry to the east side of Hickey. The new entryway is designed not only to improve the building's appearance, but also to serve as an airlock against the winter weather. The University decided to honor the Magnanos in part because of their $2,030,000 donation to the University's 150th Anniversary campaign, the first $1 million of which was donated August 13, 2007. That $1 million will be used to support the Enchanted Mountain Scholarship Fund and provide for annual maintenance of the Magnano Center. The rest of the planned donation will be used to fund Anniversary Campaign priorities and provide monetary gifts for the Bonaventure Fund, the University's annual giving campaign. 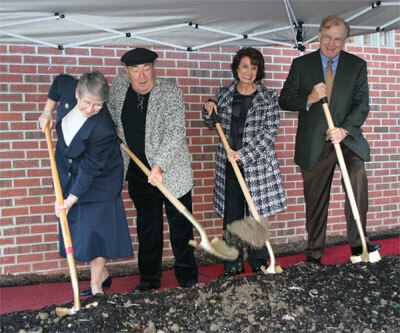 Groundbreaking for the Magnano Center, 6 October 2008.
and John R. McGinley, Jr., Chairman of the Board of Trustees. Louis and Patricia Magnano are well-known philanthropists in the Olean area. Mr. Magnano, a longtime Olean businessman, is the president and CEO of Park Centre Development. In addition to their donation to the 150th Anniversary Campaign, the Magnanos also supported the center-court scoreboard at Bob Lanier Court in the Reilly Center arena. The Magnanos have also donated much money in the Olean area, including supporting the repair and maintenance of the Olean Recreation Center ice rink and providing the funding for the Louis A. Magnano Heliport at Olean General Hospital. Click here to visit Hickey Dining Hall! Click here to visit Café La Verna! Site built by Ellen Winger during History 495 internship, Fall 2008. Any changes, other than minor editing, are noted below.